The Black Heart, Camden! Heavier than the Underworld, but without the sweaty Goths of the Hobgoblin. Tonight’s patrons seemed to be 50% Lilliputian women and 50% cousin It from the Addams Family. It was the majority though, who were here to see headliners Lonely Kamel. The night started off well, with The Order of Israfel, Gothenburg’s premier doomsters featuring ex-Church of Misery guitarist Tom Sutton. The set started a bit sketchy vocally, as the opener ‘Wisdom’s sustained vocal notes deviated slightly, but by the second song the band were on top form. Having only ever heard the title track off their latest album “Wisdom” on record before, I was stunned by how good these guys were live. Granted they needed to warm up a bit before sinking into their set, I was constantly dumbstruck by the consistency and tightness of their playing. The bands Scandi roots are very obvious in songs like “The Earth Will Deliver What Heaven Desires”, of which I was so blown away by. I actually had to go up to the drummer once they finished the show to ask what the track was called! The final remark I have is that their riff progression were seamless. Great use of small repeated phrases and lead sections flow into each other effortlessly, never leaving you with that feeling of “When will this song end!” Perfect band, ace performance. Would see again! Second up was Birmingham lovelies Alunah. Leaning more towards the heavy doom side rather than the hard rock theming of the other bands, front woman Soph Day showed us her pipes in full force as she led the band through a slow, stoney set. 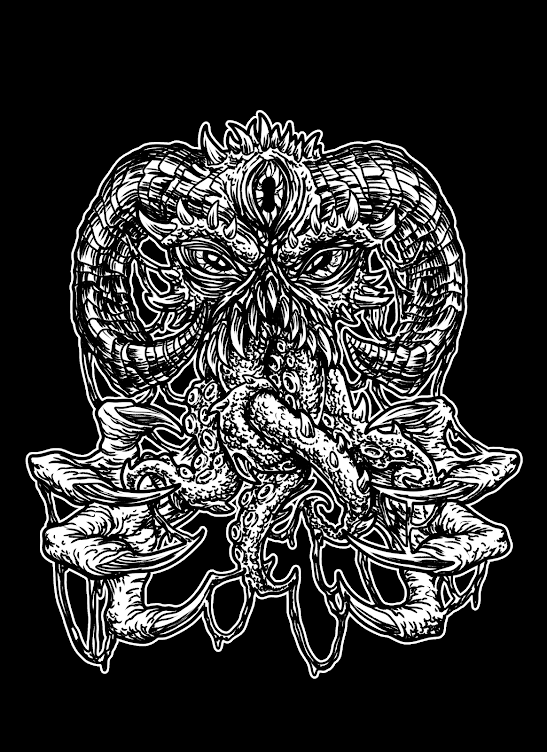 Sludgelord regulars will be very familiar with Alunah. Their sound really is tailor made for our readership, and I can say with full confidence that their live sound and performance is just as stunning. Soph manages to hit every note, while the other band members keep a tight foundation of boomy, gloomy heavy. Having been at the front for The Order of Israfel, I found myself having to move back to about ¾’s of the room’s distance from the stage, as the bass was so heavy it just muffled the sound. They were also kind enough to sign a cassette tape of their latest album “Awakening the Forest”, which I highly recommend picking up a copy of! 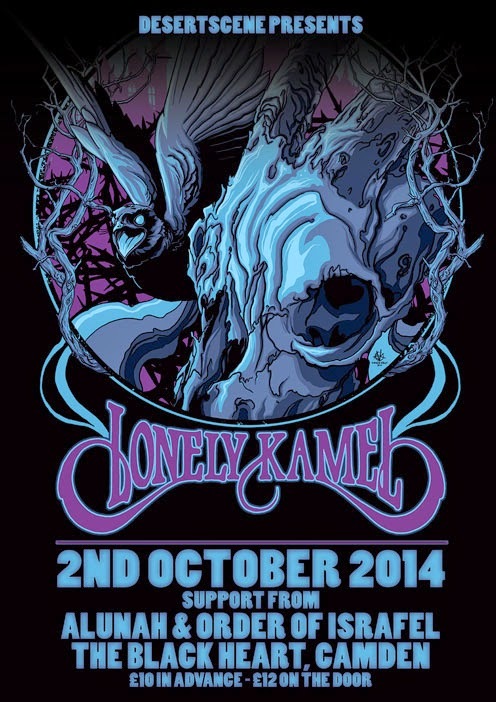 Lastly, Lonely Kamel pulled out all stops with their filthy hard rock stylings reminiscent of a drugged up Motorhead. They pulled in a huge crowd and absolutely gave them the best show, with showmanship and great crowd interaction trumping the other bands tenfold. They had a fantastic vibe about them; you could feel the beer and weed evaporate off their instruments while they ploughed through filthy songs about drinking and fornication. Their scuzzy, riff heavy guitar work was only complimented by the singer’s fantastic performance. Just the right amount of growl and melody made him the perfect front man to complete this ensemble of degenerates. Although the majority of the crowd seemed to be there for the Kamel, it severely thinned out towards the last quarter, which was kind of understandable as the night had started at 7.45pm and it was pushing 10.45pm now. And with that, my only criticism, their set was just too long! Perfectly paced, with a great song selection, but far too long given that the night had 3 bands on the bill that each played a considerably long set too. Honourable mention must go to the sound guy for the first and last bands, he absolutely smashed it! The only dampener on the evening was a problem with the mixing desk during the first song of Alunah's set, so the in-between-set music continued to play for awhile after the song had finished, massive shame! Thanks for reading y’all!